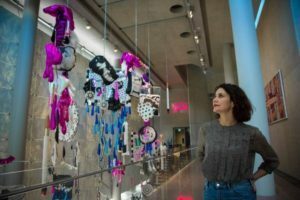 The National Gallery of Australia teamed up with Sydney philanthrophic organisation The Balnaves Foundation to commission an annual series of intervention art by Australian contemporary artists. The first works commissioned for the acquisitive exhibition, which will be launched with a party on May 4, were Sarah Contos’s suspension work Nikola Tesla Sends Theda Bara To Mars (2017-18) and New Zealanders Jess Johnson and Simon Ward’s virtual reality interactive world Terminus (2017-18). 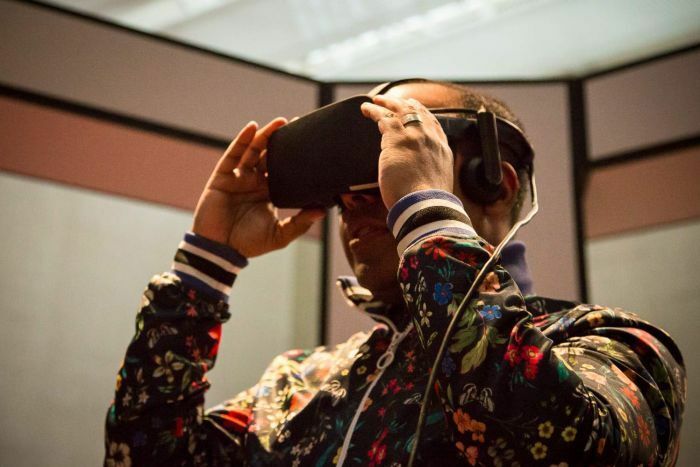 Both were firsts of their kind: it was the first time a contemporary suspension work was hung in the foyer and the first time a virtual reality world had been created for the national collection. 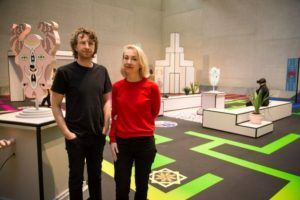 Senior curator of contemporary art Jaklyn Babington said Sydney artist Contos was someone who could work with the challenge posed by the gallery’s foyer with its 14-metre height, uneven spacing and pedestrian traffic. As for Contos’s work’s title, while a Serbian-American engineer and a silent screen siren might seem to have nothing in common, Contos said the inspiration for the title came from “a great story about Nikola Tesla working on wireless communication. While their names were given to the work, neither Tesla nor Bara are depicted, though other stars from various eras of cinema – including Gloria Swanson, Joan Crawford and Jack Nicholson – can be seen and imagery, textures and iconography reminicent of cinematic tropes – teardrops and rain, for example – are also present in its hanging imagery. Johnson drew the art that formed the basis for the designs Ward, working with virtual reality developer Kenny Smith, used to create the VR world in Terminus. People will go from headset to headset to continue the adventure and there will also be areas to explore in the gallery space itself. Terminus will run until August 26 in Contemporary Galleries, National Gallery of Australia. Nikola Tesla Sends Theda Bara To Mars will be in the National Gallery of Australia foyer until September 24.